Loyalty Points, or Customer Reward Points, are assigned to customers on successful completion of orders. Exactly how much of a customer's purchase is converted into Loyalty points can configured via Settings > General Settings >> Display Settings >> Customer Loyalty Rewards Percentage. Here, this value determines how much of the customer's order total translates into Loyalty points. For example, if the Customer Loyalty Rewards Percentage is set to 5% and the customer places an order with a total of $120.35, the customer will get 120.35 x 0.05 = 6 loyalty points. Loyalty points can be used as cash, and each point is treated as $1.00. 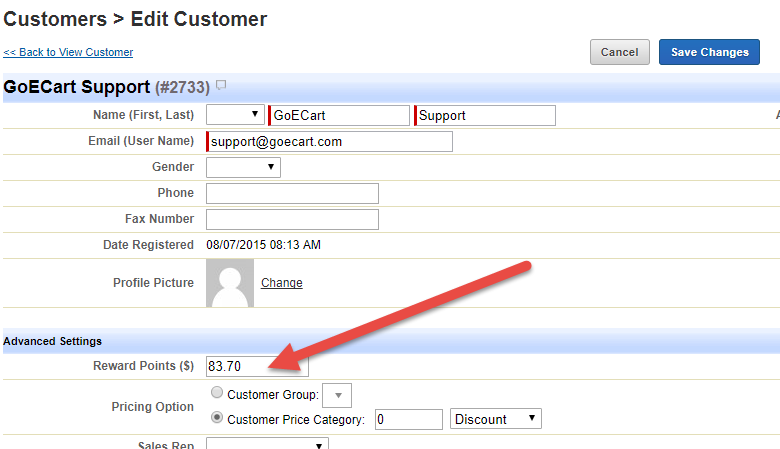 Here, we can specify the minimum amount of points that can be used to apply to an order. For example, if we set the Customer Loyalty Rewards Minimum Redemption Amount to 20, then customers cannot apply Loyalty points to orders until they have at least 20 points. The Loyalty Rewards Points module is an advanced module that requires installation to your site. If you do not have this module, but are interested in obtaining it, please submit a support ticket to get started. Known limitations: Customer reward points are not subtracted from customers when returns are created. An admin will need to manually adjust the customer's reward points total.